IMAGE: Om Puri in Govind Nihalani's Dev. Om Puri, one of cinema's most accomplished actors, may not have a hysterical fan following, may not earn big bucks, but he has consistently given us some of the finest performances on screen and is the face of Indian cinema in the West. Honoured with the OBE, the Order of the British Empire, for his contribution to British cinema, he received a BAFTA nomination for East Is East in 2000 and has along the way, won two National Awards and the Padma Shri for his acting. On his 55th birthday, October 18, 2004, Rediff.com celebrated the truly great actor with an exclusive interview. 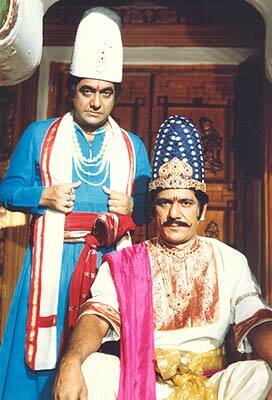 IMAGE: Anjan Shrivastav and Om Puri in Discovery Of India. About the roles one wants to do, one used to ask in drama school, that I want to play Hamlet, Othello... I came to theatre and then to films with some idealism. I want to play not only the heroes of the past, but the heroes of today. I consider Kiran Bedi a hero of today. I consider G R Khairnar (former Mumbai deputy municipal commissioner) a hero of today. T N Seshan -- a hero of today. There is T Chandrashekhar (former Nagpur municipal commissioner), Arun Bhatia. All these people who are contributing so much to life without compromising or sacrificing their own interests. Not bothering that politicians will be vindictive towards them, not caring about this. See Kiran Bedi -- she says I don't give a damn, what can you (government) do? You can only transfer me, fine. Wherever you want to send me, send me. Isn't this is a pity? She was called 'Crane Bedi' (Bedi was in charge of traffic during the 1982 Asian Games in New Delhi and earned that name due to her strict enforcement of discipline). You gave her a responsibility and if a crane took away some influential guy's car, it's not her fault! It is the law, the law should be same for everybody. These are the kind of films I want to do, but it is not in my hands. I have to choose from what I am offered. Like Dhoop. It was based on a true story of a young soldier who was killed in Kargil. His father was given a petrol pump in his memory and had to go through the bureaucracy to get it because everybody wanted money. He refused to pay a penny. Finally, he got fed up, went to the prime minister and told him -- 'I have given my son for the country and this is what happened to me. You can take your petrol pump back, I don't want it.' Fourteen people were suspended. It's a serious film, the producers didn't have much money to publicise it, it wasn't distributed very well, but at least your government, your national awards -- they could have at least mentioned the film? I'm not saying technically, it's a super film, but it's a film that speaks the conscience of its people, talks about the harsh realities, so at least it should have been mentioned. Maybe some people would have heard of it and seen it on DVD, VCD -- there are wonderful performances. 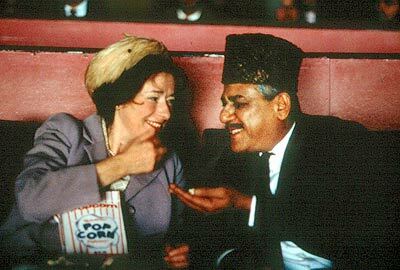 IMAGE: Om Puri with Linda Bassett in East Is East, the film that made him a star in Britain. Awards do give you happiness, strength, faith. They give you purpose in life, consolidate your belief in yourself, but at the same time, one shouldn't sit on them. It's a happy moment to be cherished, shared with friends and then forgotten. That's how you move ahead. Of course, you don't forget your first moment of glory, happiness, recognition. My first National Award was for Arohan -- a film that has not even been seen. It was only released in Bihar and Bengal. Produced by the West Bengal government it was based on a true story of a small farmer who fought for his small piece of land for 14 years. He won the case after 14 years and ironically died after a year-and-a-half. I wasn't even aware at that time that there was something like a National Award. This was in 1981. It was an evening at the French embassy where they were honouring the unit of Bhavni Bhavai. There was Shyam Benegal, Govind Nihalani, Ketan Mehta, Amol Palekar. I said, 'Ah! ', and everybody congratulated me. My photograph was in the paper the next day, of course it was a very happy moment. IMAGE: Om Puri with Rachel Griffiths in My Son The Fanatic. Tamas, Ardh Satya, My Son The Fanatic. I think Tamas was a milestone. My Son The Fanatic is a very relevant film as far as Indians abroad are concerned. The film speaks about the truth, the reality of those people who are living there. The father in My Son The Fanatic is a liberal. Total contrast to East Is East. Though he is a working class man, he has wisdom and can argue with his son. The father in East Is East can't even argue. The father in Fanatic is a truly liberated man, a man of the world. A person of his thinking can adjust in any part of the world because he has no hang-ups, no complexes. I had first refused the play East Is East. Then when they made the film, they got in touch with me again. East Is East was the high point. Recognition had started in 1991 with the City Of Joy, but for East Is East I was nominated for BAFTA and the London Film Critics Award. It was a great feeling. You are being recognised as one of the five best performers of the world! I feel whoever is nominated -- whether for the Oscars or BAFTA -- is almost equal to the winner. Like they say -- unees-bees ka farak hai. Kevin Spacey gave a wonderful performance (American Beauty), he is a great actor. He deserved what he got, but the other four who were nominated were close. 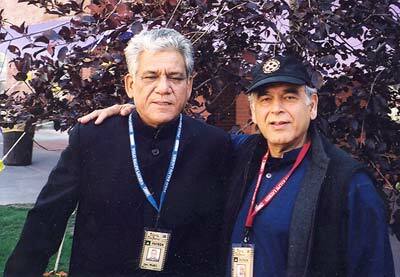 IMAGE: Om Puri with Ismail Merchant, who directed him in The Mystic Masseur. I am very happy working there. They are very disciplined, organised. They don't waste money because they don't have much money. Unlike American cinema which has pots of money with films costing 200, 175, 75 million, British films will be 3, 5, 6 million, that's the upper range. They are not indulgent. Plus, Britishers, by nature, are culturally stronger than Americans. They make films that are culturally rooted which suits me. I want to work in films that are close to reality. I love working there even though it is less money than American films. I have been working there since 10, 11 years, I never felt a sense of any discrimination. Nil, zero. There must be very few actors who are invited abroad because it is expensive. They give me air fare, either first class or business class and first class accommodation in central London. Never have I felt discrimination on the sets or in their behaviour, whether they were assistants, production people, chauffeurs. They love me. I have never given them a chance by throwing any kind of tantrum. Yes, I know what my rights are and what I deserve and I ask for it. I haven't had to ask, but I would ask if I'm not given that. Sometimes the weather is also harsh. The weather is harsh in India also in the summers, but it is killing to shoot in these studios. Our studios are pathetic, no AC, not very clean. There, the shoot depends on what your role is -- White Teeth was tough for me and so was My Son Ihe Fanatic. I did not even have a single day when I was not shooting. Only Sundays was chutti. Every day I would go to the sets as a cameraman would because I was in every single shot. They start early, sometimes 7 am, sometimes 6.30, and their shift is for 11 hours. Our shift here is supposed to be 8 hours, but now because filmmakers have learnt from television they have 9 to 9 shifts. Some filmmakers are more indulgent who carry on even further than that. Unko jab thakavat ho jayegi (when they are tired)) then they will say packup, they are not bothered about other people. It's a joy working there. It's good work and when you come back it gives you pleasure. On returning you take a shower and look at the day and say, 'Ah! Nice scenes we did!' And you relax and recover soon. Here sometimes you are doing nothing in the day, but you are there for the shoot. You come home and it can be very frustrating, with that frustration the tiredness does not go, you know. Good work gives you that strength and kick. 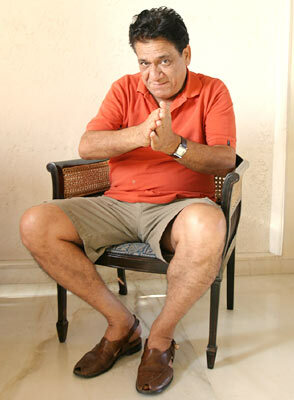 IMAGE: Om Puri at his suburban Mumbai home. Generally, my strategy has been not to overbook myself. I keep myself busy for three, four months, hoping something better will come and fall in my lap. If nothing happens after two or two-and-a-half months, then I pick up something else. At a given stage, I am busy for three months. That's how I'm able to honour any offer that comes from abroad or from here. Like Dhoop, which came suddenly. For films like Dhoop they want to shoot at a stretch because it becomes expensive for them -- 30 days at a stretch. I love that. That's how films should be made and that's how they are made abroad. Not like us, one film is being shot for one year, one-and-a-half year. I was startled. I knew of the OBE -- which is like our Padma Shri or Padma Bhushan -- but didn't know it was also given to people who did not live there. I thought kahi galti se to nahi diya (maybe it was given by mistake)? Thinking that I am a citizen of England! My wife called me because I wasn't home. She said good news for you -- you've been given the OBE. I was numb. I said you are not telling this to anybody till I come home. I came home, saw the letter, saw the stamp, the insignia of the embassy and telephone number. I called them and said I want to speak to British High Commissioner Sir Michael Arthur and he came on the line. 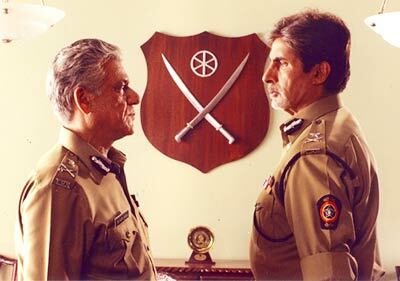 IMAGE: Om Puri and Amitabh Bachchan in Dev. Lot of people feel that cinema is purely an entertainment medium. I disagree with that. Entertainment is a part of it. But to waste such an effective medium would be a pity. I think it has a much bigger role to play, to create social awareness, harmony, to bind different religions together, to fight social evils like casteism. All said and done, though India has progressed a lot in the last 30 years -- we are self sufficient in food. In fact, we have surplus food, we can afford to give it to other countries if they suffer, but it is a pity that still in our slums people are hungry and unemployed. Just about 12 to 14 years ago we couldn't make a trunk call, we were yelling on the phones, you couldn't hear clearly, it would take hours, you would have to do a lightening call if it was very urgent and pay eight times the cost. But today even small villages have phones, we have cell phones and all kind of automobiles, but all this development seems restricted to cities. I feel cinema has a huge role to play in educating people, in making them aware, in creating values in a society. I don't deny entertainment -- entertainment is a very important part of life. It is very important to laugh, but what kind of laughter? 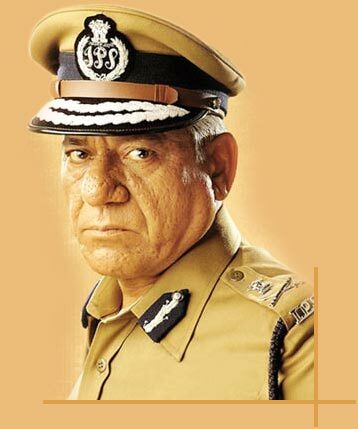 IMAGE: Om Puri in King Of Bollywood. I would love to get work in Hollywood. They will give more money. Working in the British film industry is more like working in a regional film. British films are small, American cinema has taken over world cinema. European cinema has been killed because of the onslaught of American films. American films are dubbed in Spanish, Italian. That audience may have never heard what Tom Cruise sounds like, what Michael Douglas sounds like, like we have not heard what Sridevi sounds like. Yes, I'd like to work in American cinema. American critics have been praising me, but I've not got a big interesting part so far. In my experience of working in American films I could see a slight sense of -- I won't say arrogance but a certain superiority. I would say Britishers are much more humble. I wouldn't say that for directors like Mike Nichols. He was very sweet. Among Hollywood actors, I have enjoyed working with Jack Nicholson the most. No doubt about that. He is a great actor. 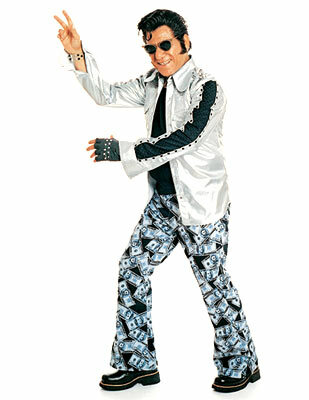 He may be a bit eccentric, but he's a great performer. It's a pity that I only had two days work with him. But in two days there was a growth in the relationship. After four, five hours of makeup on the set I went and asked the chief assistant that I wanted to know if there was some corner where I could smoke. Then we had a rehearsal where an entire five-page scene was my scene. I had to do the all talking and most of the time Jack Nicholson was listening. After we did the scene, the chief assistant must have asked Nicholson if I could smoke in his area... he didn't reply. After the rehearsal, Jack was going through the corridor, near the door he turned back, looked at me, very naughty kind of expression, and made the smoke sign. So we sat together and smoked over ample number of coffees. 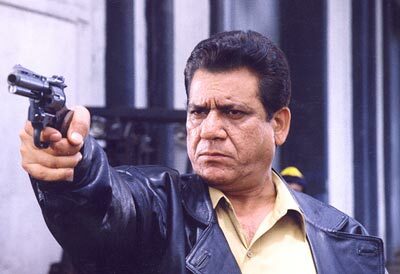 IMAGE: Om Puri in AK 47. On what basis, do we say India Shining? What is all the hoo-ha about August 15? How can we be happy? Yes, it is a happy day, but how can we forget people living on the streets, in poverty? Still in our villages there is no water, no electricity for 18 hours, in summers they can't put on fans. They don't have this little comfort of cool breeze. These basic things are not there and look at the political gimmicks! Every year there is sukha (drought), but nothing is being done. The Opposition, whichever bloody Opposition, they don't play a positive role. If the ruling party wants to do something good, the Opposition feels insecure that they will consolidate their position. That is not the role of the Opposition, how can you put your party or yourself before the interest of the nation and the people. It is a very sad state of affairs. People should start reacting. I am not saying violent (reaction). You can't stop people who are violent by nature, they have been there in history, they will be there in the future. The only request to them is that they must target the right people because you cannot curb their instincts, they are angry people. Politicians are to be blamed today, they are the number one enemy of the country. I would really request people that if they support a party but see that they are fielding a person who has a criminal record, they should not bring the party to power. Suppose if I am a Congress sympathiser and in my area the Congress person I am supposed to vote for is not a good man I will not vote for him. Common people have nothing else, the only power they have is that vote.